Cupcakes 'n Daisies: I'm still here . . . I'm still getting settled around the house, but the last worker left last Tuesday so all that's left is to clean up the dust, paint specks, and move everything back that we had to move out, that's all. I'm still moving into my new sewing studio and haven't sewn in weeks. I'm hoping that changes soon, very soon. I already love the extra space I'm gaining with the new room. just in time to enjoy before Halloween. I've got a new place to display some quilts, between the kitchen the living room. I asked Dawn at the Sewing Basket to use a quilting pattern that looked like fog floating around the stitched blocks. I think she captured the the feel I was wanting perfectly. The blocks for Hocuspocusville were generously stitched for me by a quilting friend, I assembled the blocks and sent it off for quilting. It was a real group effort and a quilt I treasure. 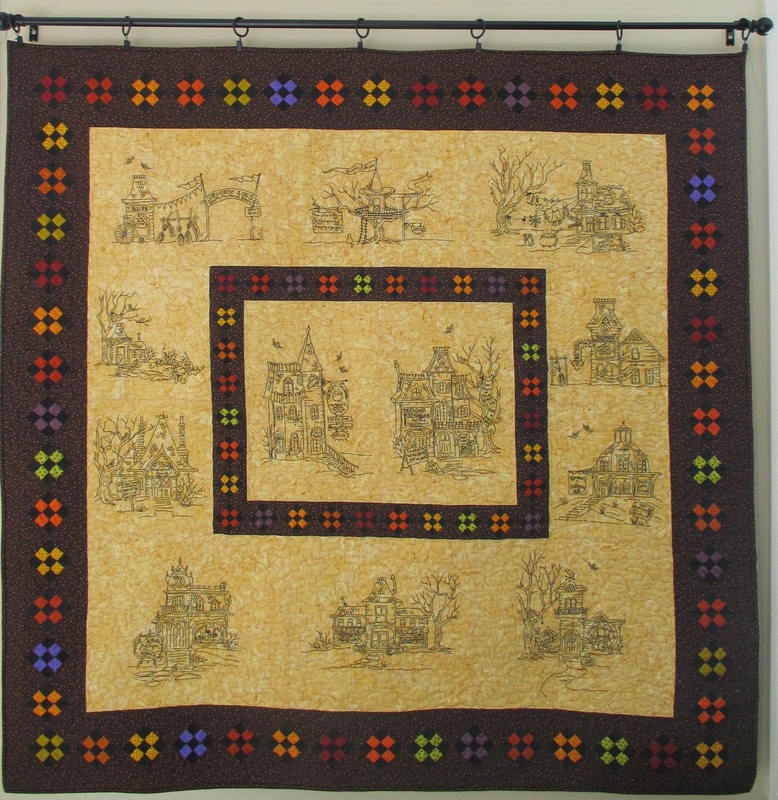 Hocuspocusville is Lifetime Quilt Number Eleventy Three, click here for more details. Hallowe'en 1904, LQ# 96 out on the bed. 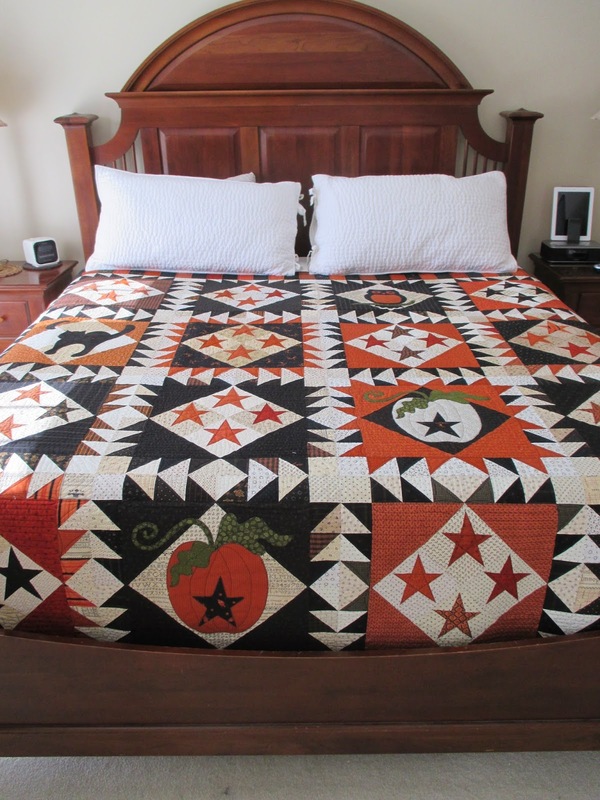 Not only am I enjoying having the Halloween quilts out, after over 6 weeks, its' great to have any quilt out! I hope to get back to sewing and regularly blogging soon, thanks for hanging in there with me. Looking good at your house! Good to hear from you...I was getting worried! It will be great to see you back and quilting again! Your Halloween quilts are fabulous! Your sewing room looks fabulous and your quilts are gorgeous! Two fantastic finishes... a new sewing room and a Halloween quilt! Great job on both! Wonderful sewing room !! So much room ! Everything looks fantastic! You'll so enjoy your new sewing space!!! Can't wait to see your first creation! Your new sewing room looks incredible! Have you made much progress with all those autumn flying geese while the work has being going on? I'm looking forward to seeing that project! New space looks awesome!!! Love your new place to display quilts too! Very pretty! You know that my English is limited, but even if awckwardly expressed, I want to tell you how admirative and thanksful I am of all I "learn" from you, your blog, your pictures, your quilts and more : even what is not formulated. You deserve the new sewing place you are going to enjoy very soon, and all the positive comments you get. Thank you so much ! What a nice quilting room ..... so cheery! Your Hallowe'en 1904 looks wonderful on your bed. Your house! It looks GREAT ..... can't wait to see more! I love all your quilts! And your quilting room is wonderful. I am going out to find a quilt hanger like the one you have on the wall...the quilt looks wonderful! I love seeing your older quilts again because I forget them from year to year. It the brown leather recliner what you replaced your red couches with?